Ansar Bait Al-Maqdis, based in Egypt’s North Sinai, has claimed responsibility for the abduction and killing of US citizen William Henderson in August this year. The group, which recently changed its name to Wilayat Sinai (the Sinai Province) and which had recently pledged allegiance to the Islamic State, published photographs of Henderson’s passport and identity cards in an online video. 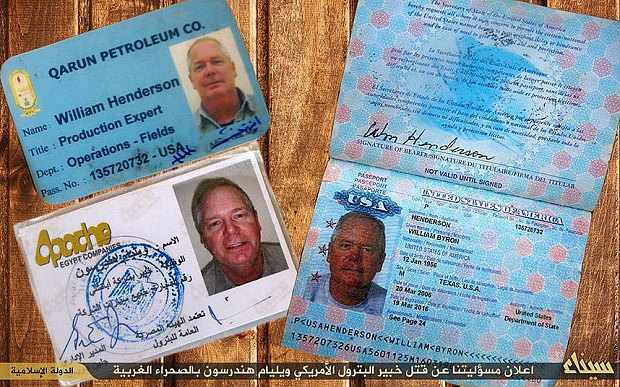 The information identified the Henderson as a 58-year-old Texan who worked for energy company Apache Corporation and Qarun Petroleum Company, a joint venture with Egypt. Earlier in August, Oklahoma’s Enid News & Eagle had published an an obituary for a man named William Henderson stating Henderson had “passed suddenly” during his time in Egypt. Meanwhile, in August, Apache had said one of its supervisors had been killed in a carjacking in Egypt’s Western Desert, but did not identify the employee. The obituary, however, stated that Henderson worked with Apache for 28 years. It remains unclear why both the US and Egyptian governments had not commented on the death in August and why Apache had not identified the employee. Ansar Bait Al-Maqdis has claimed responsibility for numerous attacks since the ouster of deposed President Mohammed Morsi. In a recent statement, the group claimed it was behind more than 10 attacks in the past four weeks. Among the deadliest attacks was one in which 34 Egyptian soldiers were killed in a suicide car bomb attack at the Karm Al-Qawadees checkpoint in Egypt’s North Sinai.